You're probably wearing something cotton-y right now. Cotton is fairly annoying to harvest. 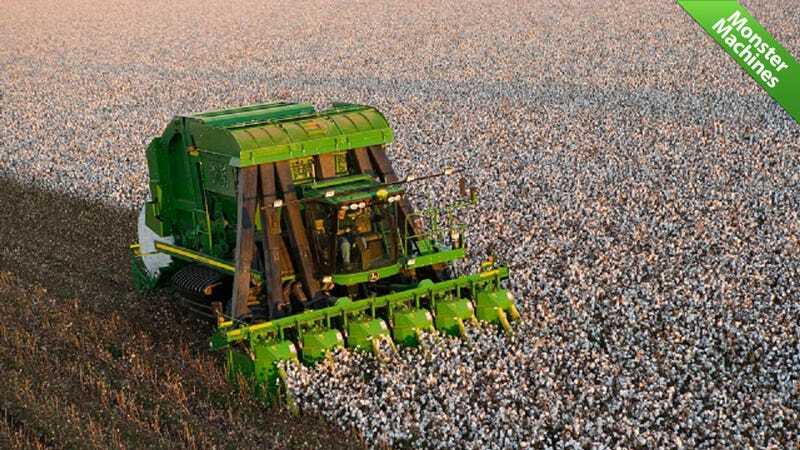 Mechanization was a quantum leap for the cotton industry, moving it away from archaic methods used since the days of slavery. This machine is the next step forward. Up until World War II, cotton harvesting in the South remained nearly identical to the way it was prior to the Emancipation, with large labor forces picking cotton by hand. It wasn't until the Great Migration had sufficiently reduced the available labor force did hand-picking become economically inefficient. When it did reach that level, mechanized processes took over. The innovations aboard the John Deere 7760 could potentially be just as big as the original move to machines. The 7760 is a Spindle-type cotton picker. As it moves down a set of cotton rows, the plants are herded towards a set of spindle bars on either side of the six picking heads. These spindles are designed to pick only the open cotton from the rest of the plant without damaging the foliage or unopened bolls. The cotton fiber is then conveyed up a set of ducts via air jets into the accumulator. There, four feedrolls convey the cotton stored in the accumulator to the two rear feedrolls that flatten the cotton into a mat and place it on a belt that feeds the cotton into the round module builder. This module builder rolls the mat of cotton into an 8-foot wide, 5000-pound stack, wraps it in a protective cover and releases it onto the transportation arms. This allows the 7760 to drop completed bundles at the end of rows without having to stop to offload its cargo. Essentially it's a method of continuous cotton harvesting, a massive step forward for the industry. The 500-hp, 13.5 L engine propels this 67,677 pound machine at a relatively speedy 5mph— about 20 percent faster than other pickers while still yielding up to four bales per acre. That's 20,000 pounds of cotton (as much as an adult Orca) harvested every acre by a single machine.